Sitka Art Circles are a way to come together in a casual atmosphere and have a bit of artistic fun. Everyone is welcome! 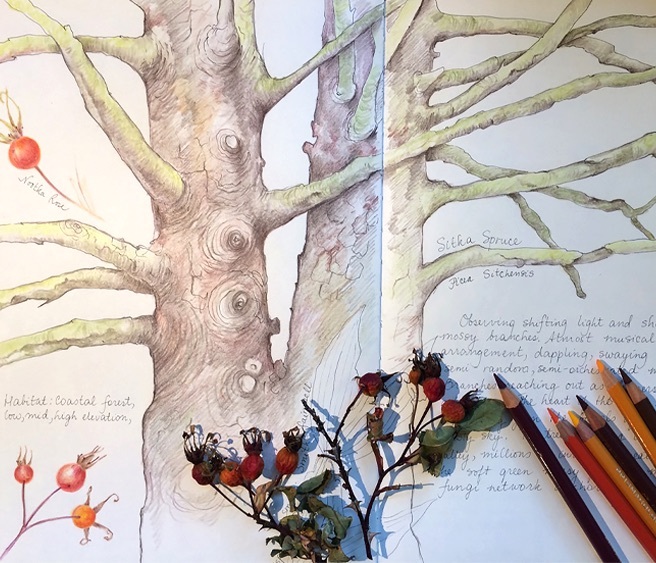 Create a sketchbook page while learning about the ethnobotanical history of Sitka Spruce and Wild Roses. The workshop will include drawing from observation and short presentations on both species. Students will complete several entries into their sketchbook incorporating botanical drawings and ethnobotanical notes. We will explore simple sketching exercises using pencil, pen and ink and colored pencils and learn how to creatively design an interesting and playful composition in your sketchbook, adding other creative elements to your sketchbook such as text, sound maps, observations and reflections. Dorota Haber-Lehigh is an artist, educator, linguist and forager. She loves gardening, hiking, field sketching, mushroom hunting and botanical drawing. Her passion is drawing native plants and discovering their edibility, medicinal use and ecological connection. She is drawn into the sculptural and architectural wonder of plants as well as the ephemeral beauty of plants throughout all seasons. She authored two ethnobotanical coloring books: ABC of Native Plants of the Coastal Pacific Northwest and Native Berries of the Coastal Pacific Northwest. She enjoys teaching ESL and Art of Ethnobotany at Seaside High School and Botanical Drawing at various community centers.